Every time I pass by 3978 Hastings St., a different Japanese restaurant seems to have sprung up there. This place is the chameleon of sushi restaurants. 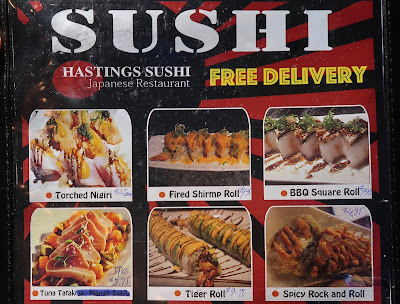 Not too long ago, it was once Little Tokyo's Sushi, and soon after, it became Ting Sushi. Now, Hastings Sushi has now taken its place. 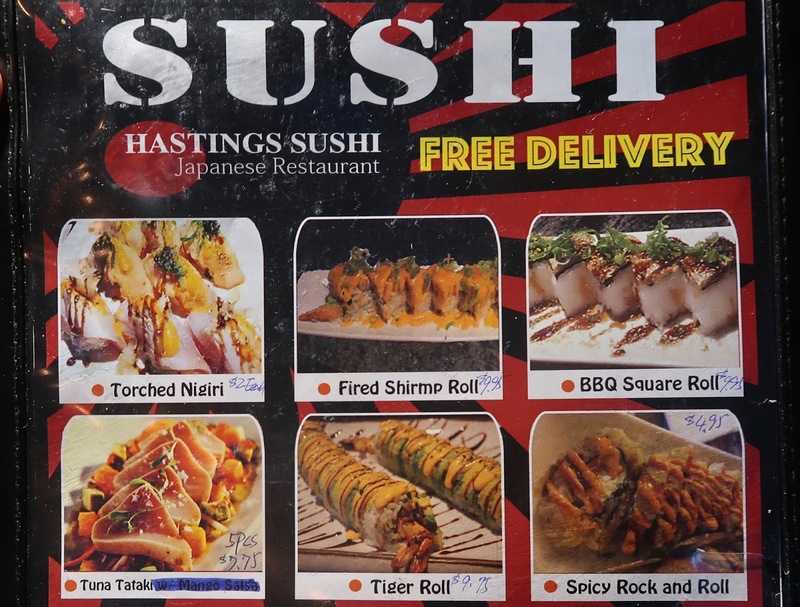 I was up at SFU to mark some assignments and needed some sushi for fuel, so I paid Hastings Sushi a visit. Needless to say, I'm quite sure I got more sushi done than actual marking that day. 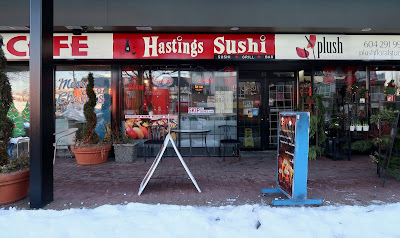 Hastings Sushi is a small Chinese-operated sushi restaurant just steps away from Boundary Road. When I entered the restaurant, there was literally nobody in sight. Not only were there no diners, but there was nobody at the sushi counter and no server in the dining area. About a minute later, the sushi chef, a young man in his 20s, emerged from the back kitchen and sat me down at a table. He proceeded to take my order. I told him the list of things I wanted, which he promptly forgot, so I had to repeat my order from top to bottom. Despite me reciting my order twice, the sushi chef still got my order wrong right from the start! I had ordered a piece of Hotategai Nigiri, not Hokkigai Nigiri (Hokkigai Nigiri is something I never order). I notified the server-chef of this, and only then did he tell me that they did not have hotategai in stock. Whatever the case, I just took what I had and left it at that. 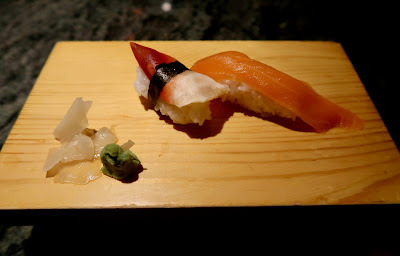 The Hokkigai Nigiri had a strong seaweed flavour, while the salmon was fresh and buttery. The rice was quite dry and did not have sufficient flavour. 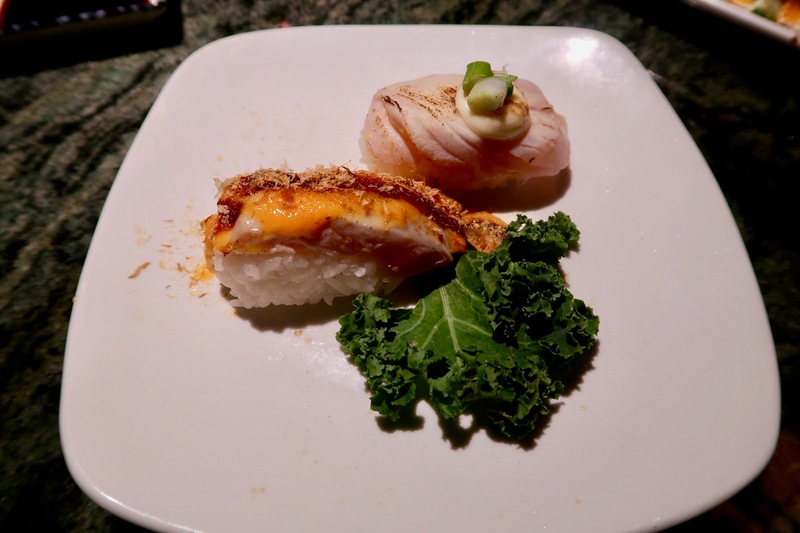 Spicy mayonnaise and teriyaki sauce were used to enhance the flavour of the Seared Toro Nigiri, while the Seared Tai Nigiri was creamy with a slight seared flavour. There was a little too much rice under the Seared Toro Nigiri, and as a result, the dryness and blandness of the rice were quite noticeable. ... yes, the one and only "Fired Shirmp Roll." Interestingly, the sushi chef did in fact say "fired" when referring to the roll. I decided to order it, since there is hardly anything more satisfying than munching on poor shrimp that have just lost their jobs. 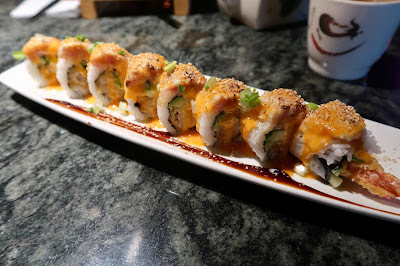 The Fired Shrimp Roll consisted of seared tuna on top of a Dynamite roll. The seared flavour on the tuna was prominent and worked well with the spicy mayonnaise and teriyaki sauce combo. Everything on top of the roll worked well. Unfortunately, the batter on the prawn tempura was quite hard, and the flavour of the prawn tempura was somehow overpowered by the small slices of avocado inside the roll. 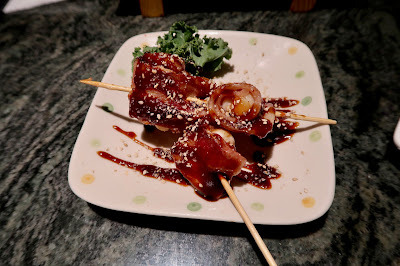 By far the best item of my lunch was the Bacon & Scallop Skewers. The scallops had a great rebound and were not tough. The bacon was on the fattier side and had a wonderful sweet flavour, and this was nicely accented by the sprinkling of sesame seeds on top. The Ten Don came with 4 pieces of yam tempura and 3 pieces of prawn tempura. Surprisingly, the sushi rice this time had quite a bit of vinegar in it. 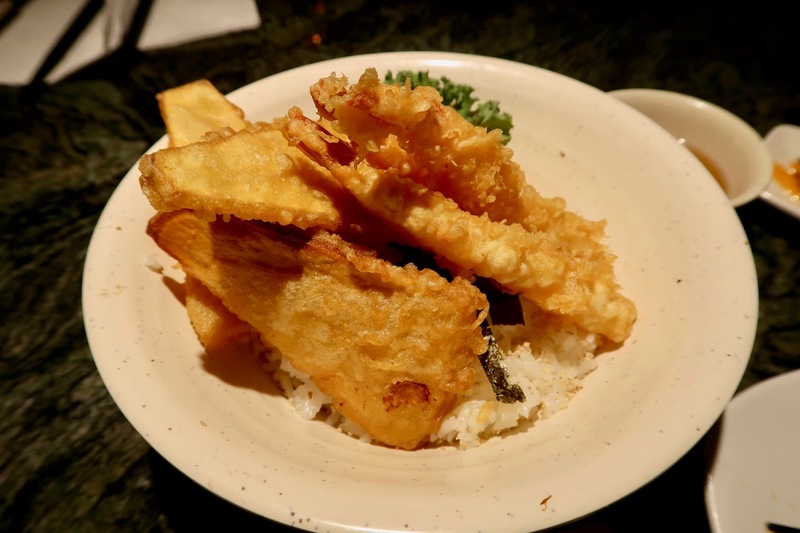 Some sauce or dressing for the rice would have helped bring the rice and the tempura together. Tempura-wise, the frying oil was very overused, and the batter turned out hard. While the prawns were still juicy, the yam was sliced quite thinly so that parts of it ended up tasting like potato chips. The sushi chef was friendly, albeit a little unenthusiastic. The food was hit-and-miss, and integrating the different ingredients together seemed to be a challenge in some of the dishes. Although the food was not expensive, there isn't much that makes this restaurant stand out from the myriad of other restaurants on Hastings St. I've always wondered how this place was, I pass by it almost everyday!